The display cabinet is finally (almost) finished! It’s been a long project, slowed down even further because of personal injuries, a hurricane, and multiple design changes during the construction, but we’re so happy with it. We ordered the glass for the shelves and mirror, and originally planned to pick it up ourselves with the help of our friend Ray and his truck. Then Skip wrenched his ankle, and we decided carrying glass around might not be a good idea, so we rescheduled the delivery and asked for the Glass Company professionals to install it. Then—wouldn’t you know it—Hurricane Hermine blew in, and the delivery was postponed again. 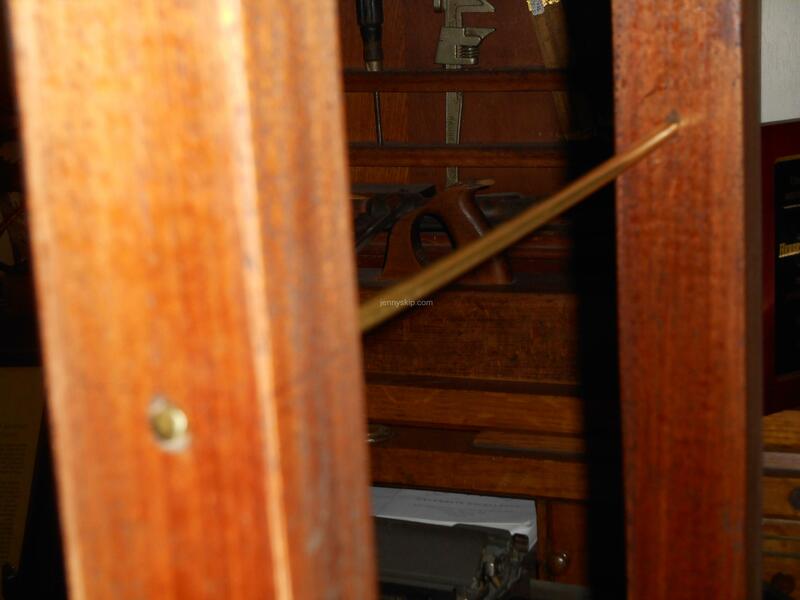 Once the mirror was epoxied in, we were able to mount the shelves on the brass rods. We ordered the mirror backing to be 1/8 inch thick, and the glass shelves with a 1/2-inch bevel on the front edges. We’re going to place felt dots on the undersides of the shelves at the points where they sit on the brass rods. And then Skip will add some molding to the outer perimeter of the mirror. Shown above are some tentative display items. 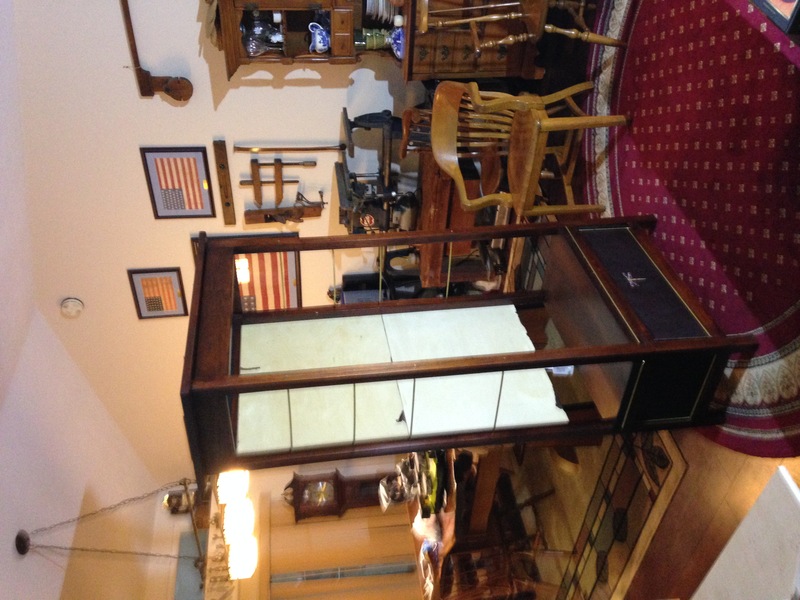 We’re enthused that we can vary the items we decide to display. According to proper fengshui, you shouldn’t place a mirror directly opposite a door, but I’m hoping that the friendly, creative, familial Qi of the objects we’ve chosen to feature on the shelves will be retained in the home. Currently, nothing is on the lower shelf, because the kittens have been jumping up there and lounging on the shelf with great delight. They are able to reach their little paws up into the next shelf, so we must favor kitten-proof display items there. 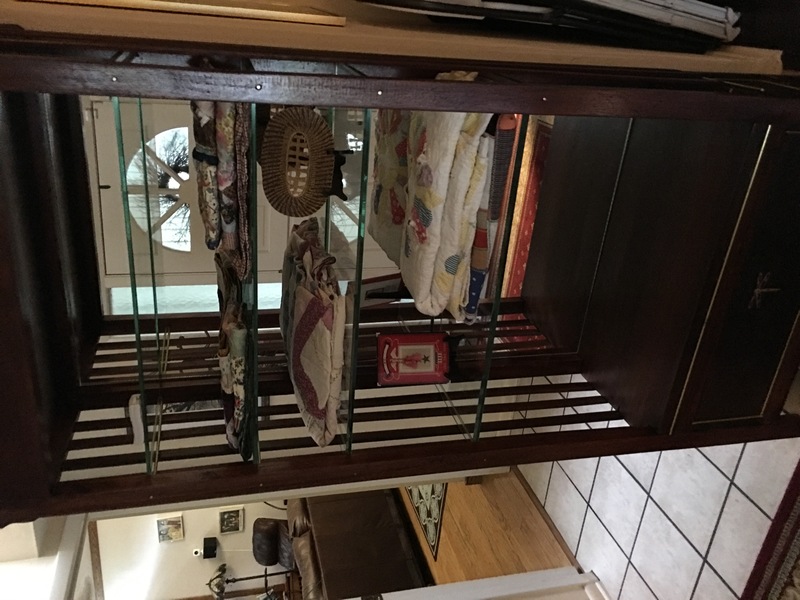 The lower shelf has two quilts my grandmother made, and an antique glass service plaque (see more about the origin of service banners and plaques here). BTW, we saw an awesome video recently about making a wooden service banner, from Opa’s Workshop (click to watch!). As for the two quilts, the one on the bottom is chronicled here in a prior post. The top one is a Dresden Plate quilt that was probably originally made in the 1950’s or 60’s. I can see places where my mom tried to mend it with fabric that I recognize from my own stash, part of which I inherited from her stash! The middle shelf has an antique quilt that my great grandmother made (see a prior post on this quilt here) to the left, and a woven pine needle mat that was made by my grandmother, circa 1960. 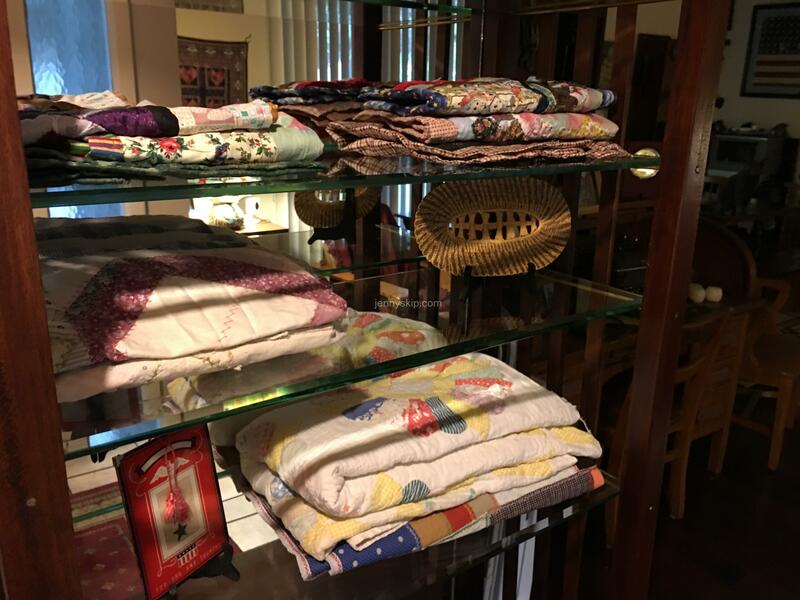 The upper shelf has several quilt mats hand-sewn by my mother during the last few years of her life, when much of her precise quilting skills and abilities were stolen by Alzheimer’s disease. But it is heart-warming to me, that she enjoyed piecing beautiful fabrics together into practical projects, even up to the end. Here’s the You-tube composite of the whole process. Another display cabinet build update! I’ll be so glad when this thing is done! From our last update, there have been some major design changes. First, I decided to add lights to the underside of the cabinet top. I used a combination of LED light strips and LED puck lamps. Using a remote control, the LED light strip can be turned on and off, dimmed and can change colors. The pucks are controlled by a switch but I plan to add a remote control to these. 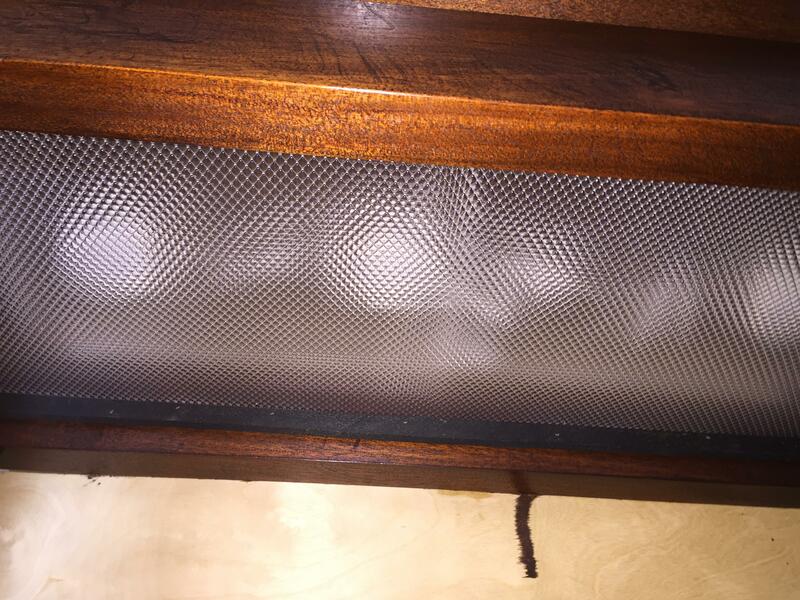 I then installed glass keepers on the inside perimeter of the cabinet upper rails and cut and installed a plastic lens from a fluorescent light fixture. Second, I added foam weatherstripping to the top edge of the cabinet so when I added the top and fastened it down, it provided a light tight joint. Third, I decided to add additional brass trim on the top rails and add corbels at each corner of the top. Fourth, I decided against adding glass to the cabinet sides. As I mentioned before, the design of this cabinet evolved during construction, bad idea usually. 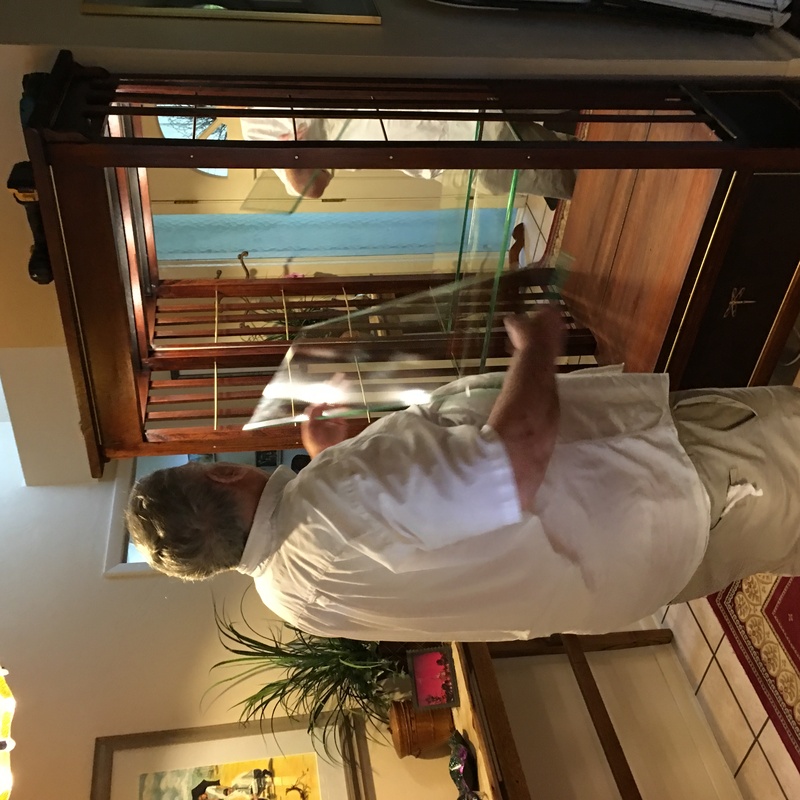 Looking at the support rods for the glass shelves, it was going to be just too tight to try to install the glass panels with keepers in the existing 5/8 inch space. Using 1/8 inch thick glass over the vertical span with no muttons was risky, in my mind. This change was also reinforced by the fact that I have many (emphasis on many) young rambunctious grandchildren. Not sure the glass would survive a visit. So I punted and decided to go mission style and add vertical slats to each side of the cabinet, pinning them top and bottom with brass pegs. Maybe too much brass!?! The cabinet has been moved to its new home where I will add the slats over the next few weeks. I’m going to wait to add the glass shelves and mirror after the grandchildren visit next week. It has been several weeks since the last update on the display cabinet. Lots of other projects have taken me away from this project but I’m back at it again. Since the last post, I have finished staining and top coating the cabinet framework, trying to give it an antique distressed look. I planed the boards for the bottom shelf and cut notches on the corner so it would sit on the bottom framework of the cabinet. I oversized the notches a little to allow the wood in the shelf to move. This left some gaps which I plan on filling with black foam rubber to hide the gaps but allow for expansion. When I had this tweaked and fitting in the cabinet, I then installed the leather veneered panels. Once these panels were in place, I set about cutting the brass rods to form a sort of molding around each panel. The addition of this metal was to complement the brass rods for the shelf supports. The brass rods used for molding were set in place using thick CA glue. I was going to try to miter the ends of the brass rods, but life is too short for this so I set the vertical rods first and then butted the ends of the horizontal rods into the vertical rods. To hold the bottom shelf in place, I used L-brackets underneath the shelf to connect the shelf to the bottom framework. Since I was too lazy to flip the cabinet on its side to set the L brackets in place, I used thick CA glue to set the brackets in place and when the glue had cured I could reach into the bottom cabinet cavity and secure the brackets with screws. Less frustrating than trying to stand on my head and hold the brackets with one hand while trying to navigate the screw in place! I had originally thought of making the bottom shelf removable or on a hinge so that we could access the bottom cabinet cavity and use it for storage. But knowing our habits, I knew that whatever we stored down there we would never see again, so I scrapped that idea. My wife would like to have a mirror back on the cabinet instead of wood, so I purchased some ¼ inch birch plywood to screw onto the back of the cabinet, to support the mirror back. I called a local glass company to get some suggestions for the glass shelves. Looks like 3/8 inch thick glass will work for the shelves. I am going to install an extra set of brass bars next to each of the bars shown in the video just to provide a little extra strength for the shelf support. I can also get the shelves with beveled and polished edges. The mirror and glass sides will be cut to size. The next step is to make the top of the cabinet, allowing for surface- mounted LED light fixtures. I need to cut the molding for the side glass panels. Hopefully by the next post, the cabinet will be complete!! You can see why it takes me so long to get something built, if you go back and see when I started this! Between teaching, grandchildren visits, woodworking merit badge stuff, etc., there just doesn’t seem to be enough time to make shavings. Thus far, I have sanded the cabinet’s framework, given it several coats of wood conditioner and added a couple of applications of Minwax red mahogany stain. There is still some blotching I have to deal with, but the distressing I applied (not a lot) really is giving me the aged look I was hoping for. I have brought it back inside to gel a little while I work on the brass and leather components. I cut the ¼ inch brass bar stock in the lengths required to span between the front and back frames to support the glass shelves. Using the golden rule, I laid out the shelf locations and made a drilling guide to help me locate and drill the holes in the frames for the bar stock. You can see in the picture where I dry-fitted one of the brass bars in the frame. I haven’t decided yet to round off the ends of the rods and let them stand proud on the front of the frame. I cleaned all the leather panels with Dr. Jackson’s Leather Cleaner from the Tandy Leather Company and then conditioned the leather with Dr. Jackson’s Leather Conditioner. After the panels had dried overnight, I gathered together a tape measure, thick CA glue and some painter’s tape. I found the center of the larger panel and marked it with a pen. I measured the dragonfly applique and tried to outline the space on the leather for the applique with the painter’s tape. Bad idea… the painter’s tape would not stick to the leather! So I made a couple more dots on the leather with a pen to guide me to set the dragonfly by hand. I did get a little squeeze-out, which was hard to remove. Not sure how to deal with this. I’m going to take a waste piece of this leather, put some CA glue on it and see if acetone will take off the glue without taking the dye out of the leather. I am considering alternatives: 1. Don’t do anything (it will be almost impossible to see the glue squeeze-out in the foyer where this will be…a sleazy alternative), 2. If the acetone removes the glue and takes out some of the dye, touch up the spots with leather dye if Tandy has some to match, or 3. Pry the appliqué off, trying not to damage it so I don’t have to go crawling on hands and knees back to the sewing room to get a new one made. 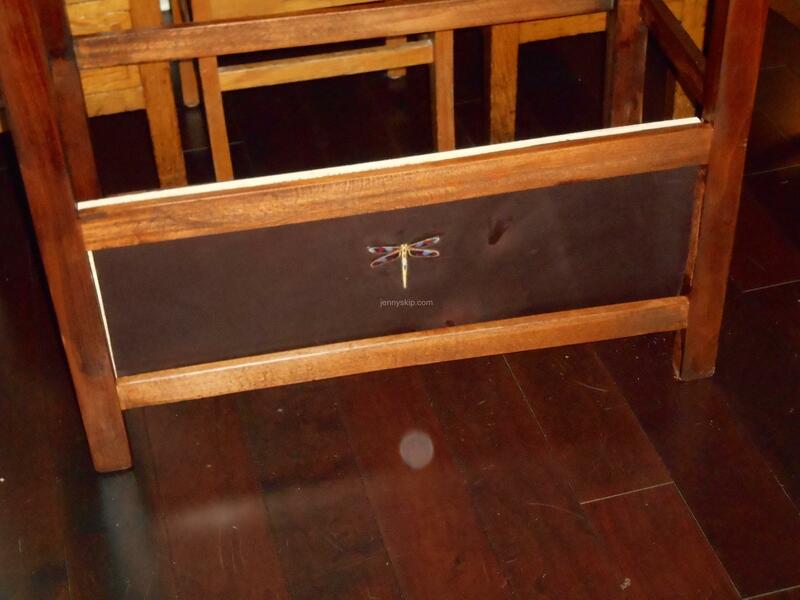 Then carefully apply the dragonfly to a square piece of the same leather, tool a border on the square and then glue the square over the damaged area of the panel. In the next post, I’ll report on how all this leather stuff worked or didn’t work. I will joint, plane and glue up the mahogany panel for the bottom shelf, finish staining and clear coating the framework and install a bottom panel for the lower compartment of the cabinet. 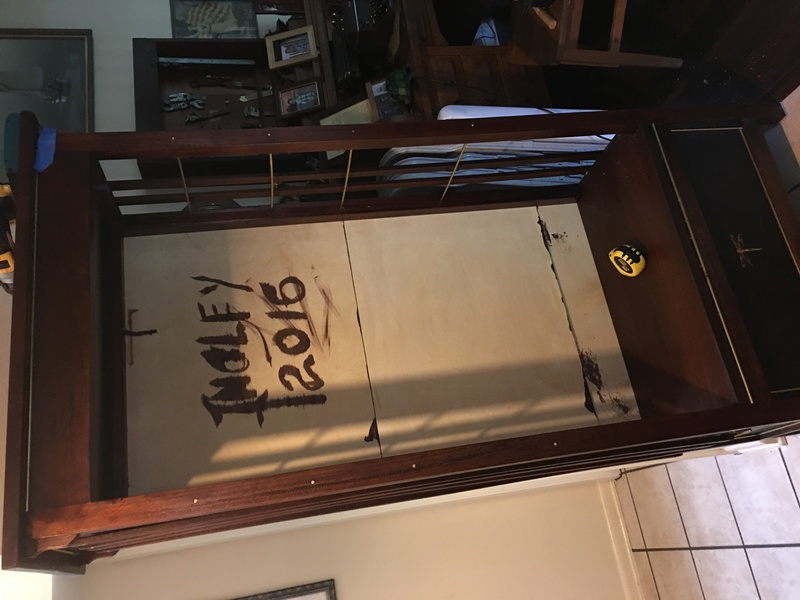 I still have to install the leather panels, miter the ends of the brass rods to frame the leather panels, construct the top for the cabinet, cut and ebonize the glass stops for the sides of the cabinet, and begin working on the back of the cabinet. Finally, a few days freed up to get back to the display cabinet build! I finished cutting out the panels that will fit in the bottom of the cabinet. 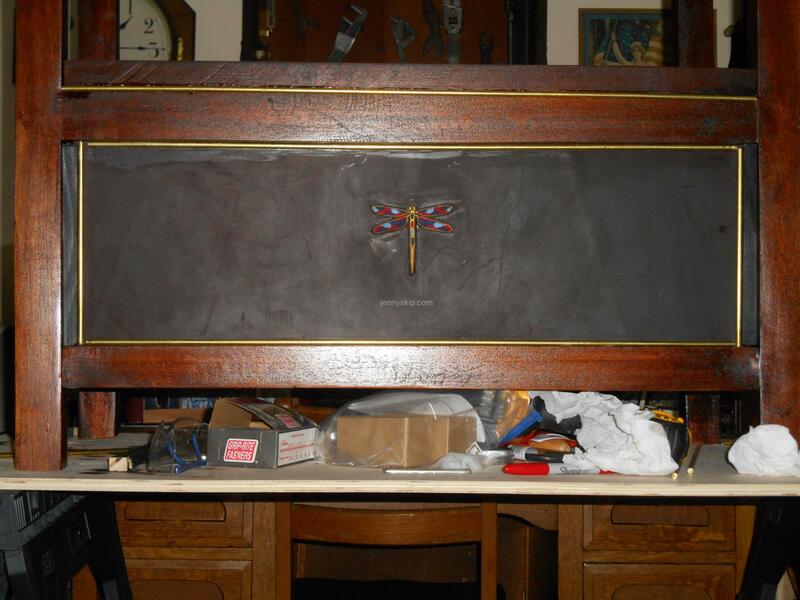 The burgundy leather was cut to fit each panel and was attached with contact cement. 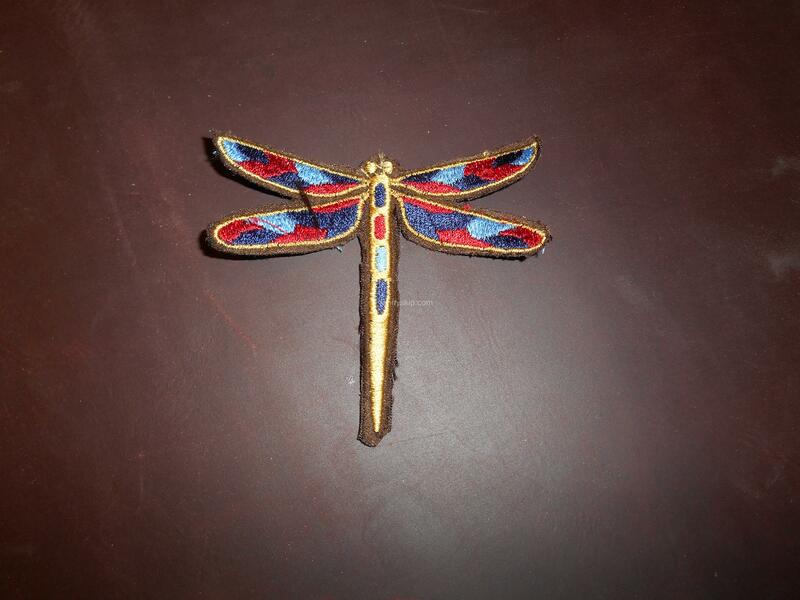 My wife has prepared three beautiful dragonfly appliqués that we will apply to the center of each leather panel in keeping with our Arts and Crafts theme. 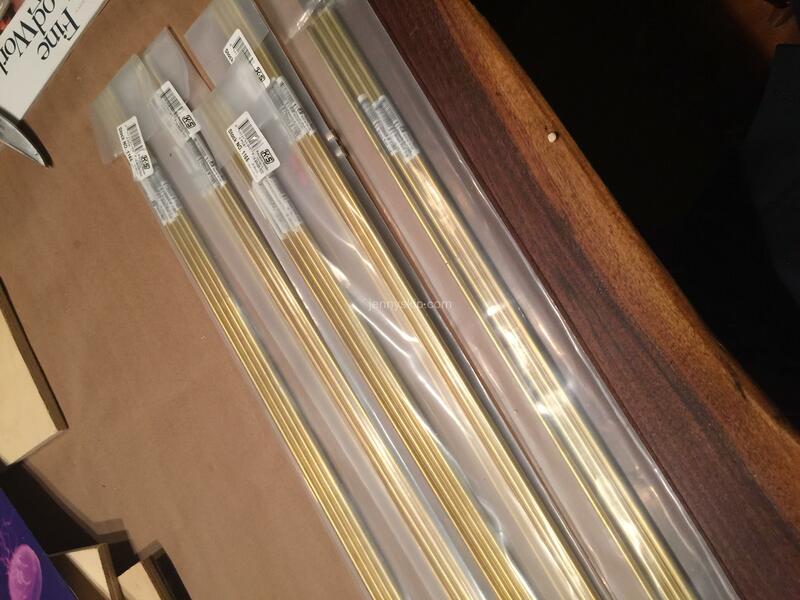 My friends at Ace Hardware contacted K&S Metals and found the 36-inch long, ¼-inch diameter brass rods that I will use to frame each of the leather panels. As with most of my furniture builds, the wood is set in the air-conditioned house for several weeks before it is taken into the shop where it is cut and milled to size. Then the pieces are brought back into the house for assembly. With a very good portable dust collection system, I was even able to cut the mortises for the dominos in the house. Of course I planned this activity while my wife was busy in the sewing room. No harm—no foul! Once the display cabinet framework was assembled and glued, I began the tedious process of sanding. We set up two work stands outside the front door so I could easily take the cabinet in and out of the house between standings. I started with 100 grit and worked up to 220. I wiped down the wood with alcohol to get off all the dust and applied a coat of wood conditioner. I have taken a test sample of this wood and sanded and stained with a red mahogany stain. It was a little blotchy, so I decided to test another piece with a wood conditioner and this worked a lot better. I decided not to use a grain filler. This wood is very smooth and not very porous. For the next phase of the project, I plan to drill the holes in the side frames for the brass rods that will support the glass shelves in the cabinet. 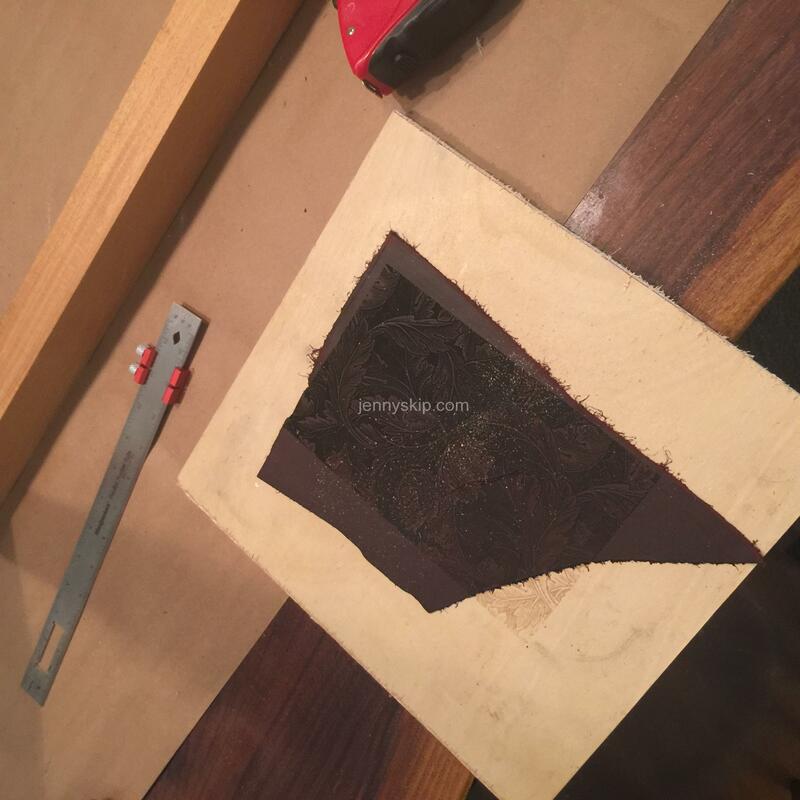 I will apply the stain to the framework, apply the appliqués to the leather panels and install the panels. I will construct a wooden bottom shelf and top for the cabinet, glue up 9-inch wide mahogany boards, sand and prep these for staining. I will also decide how I am going to deal with the back of the cabinet. An easy solution would be to install a mirror with a plywood backing but my wife is voting for mahogany panels. I think in this election, she gets more delegates!! I may start cutting, sanding and finishing the glass stops for the glass side panels. My thoughts on this are to use ebonized cherry for the stops but I don’t want too many things going on with this cabinet. I already have red mahogany, brass, leather, glass and embroidery appliqués! For the past 20 years I have worked to develop skills necessary to build furniture for our home. I strive to improve my artistic ability but being an engineer, I am more comfortable with a set of plans to follow and when I can make subtle changes to personalize the build. The photos below illustrate some of these builds. Most of these projects were built with plans from magazines like Fine Woodworking and Popular Woodworking. 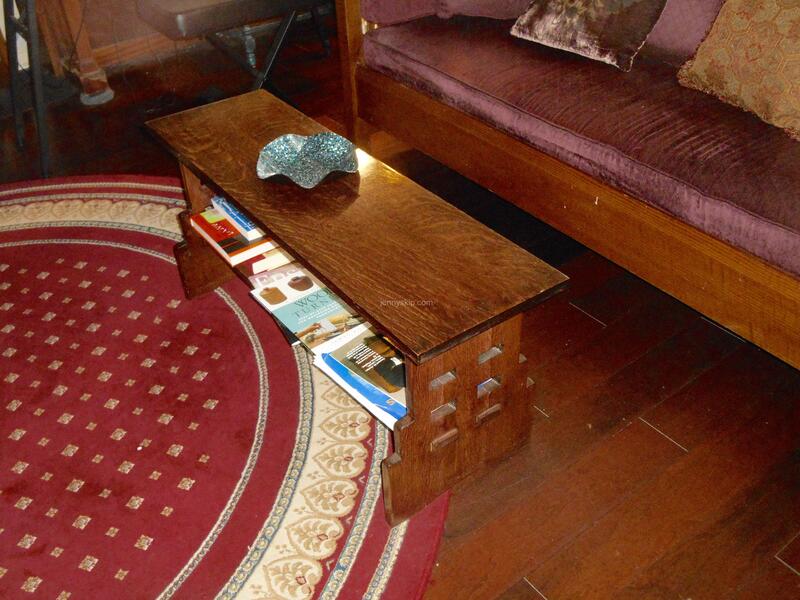 The coffee table/bench shown was one of the first projects built with only a plan visualized in my mind. Since then, I have constructed a dining room table with two natural edge slabs of walnut, again, with a plan visualized in my mind. Now let me say though, that I did get help from books on furniture construction, for typical dimensions for dining tables. 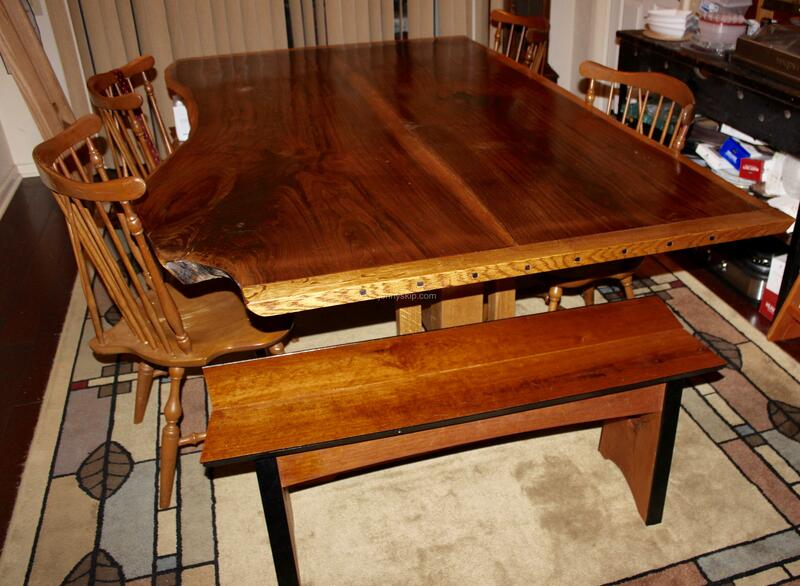 Natural-edge dining table. I also built the benches at either end of the table. This leads me to this current build, a display case. 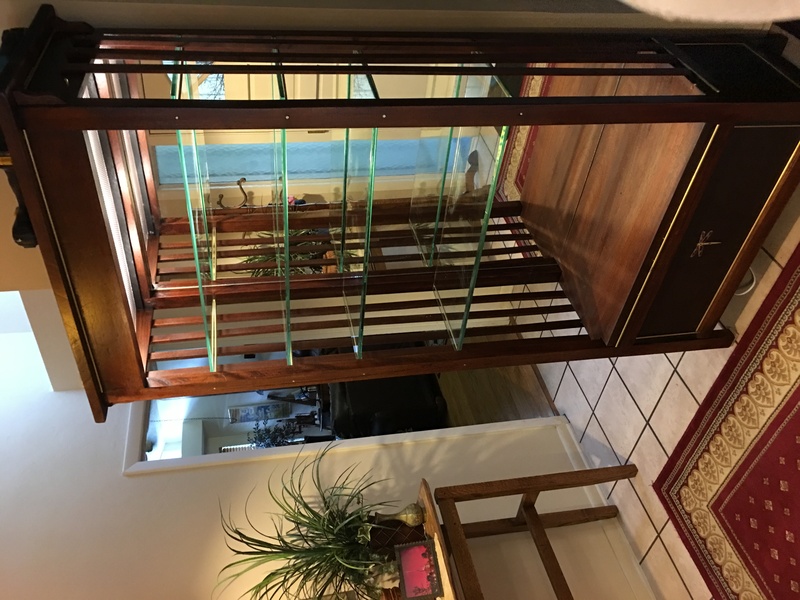 We are running out of space for new furniture but my wife managed to find a space for a new display cabinet. Most of my projects take close to a year to complete, due to my schedule. I also generally shift the construction to my living/dining room. Matter of fact, I assembled most of the new dining room table on the old dining room table which is now in the breakfast area. I usually bring the wood for the project into the air-conditioned space prior to and during construction so that it can reach equilibrium with its future home. On the downside, it may take a major wall deconstruction to move some of this furniture out of the house. On the upside, I have a loving wife that supports my living room shop practices! EXCEPT when my assembly practices on the dining room table interfere with her quilt layout needs. On to part one of the build: I made several freehand sketches on paper to explore some of my ideas. I relied on some texts on furniture design to zero in on the dimensions, but decided to let the design flow as I constructed the cabinet. Now I am going to play the old age card. 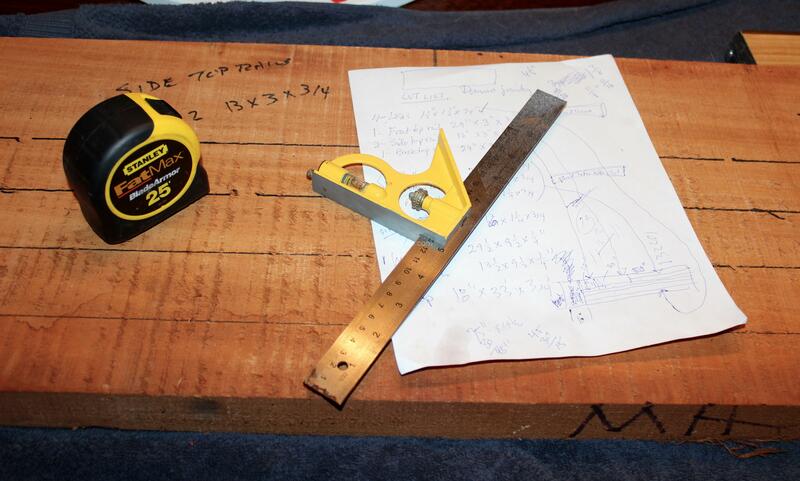 I don’t have the time I’ll need to hand cut my mortise and tenons. So for this project, I decided to use loose tenon construction with dominoes. There, I’ve said it. And if it would have worked with my mental plans, I would have used pocket hole construction. 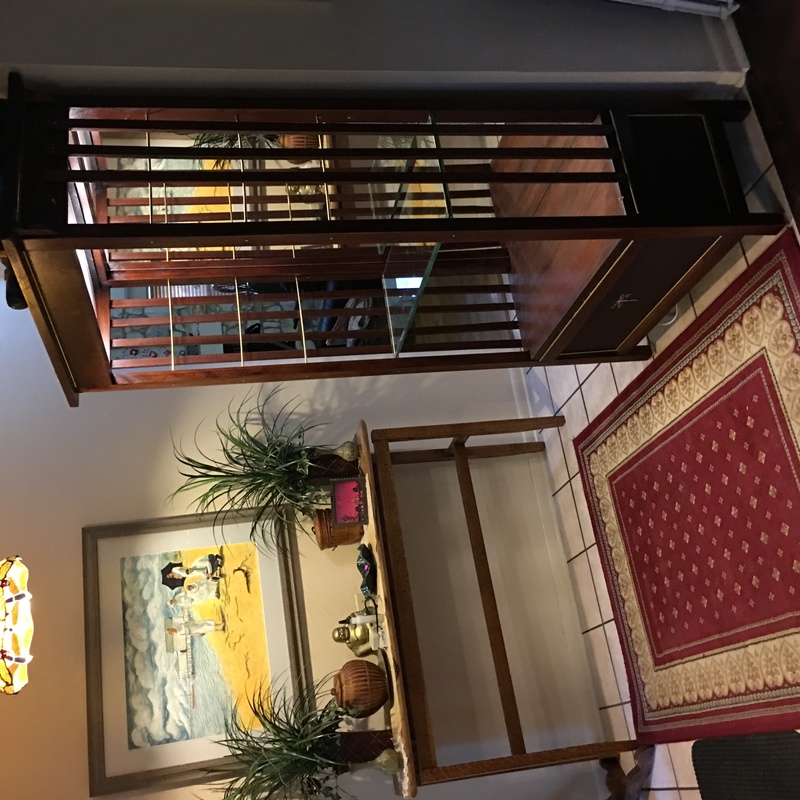 The overall dimensions of the display cabinet are 16 inches x 32 inches x 75 inches. I chose mahogany for the primary wood. Baltic plywood and poplar will be used as secondary woods. The shelves will be glass, supported on brass bars. 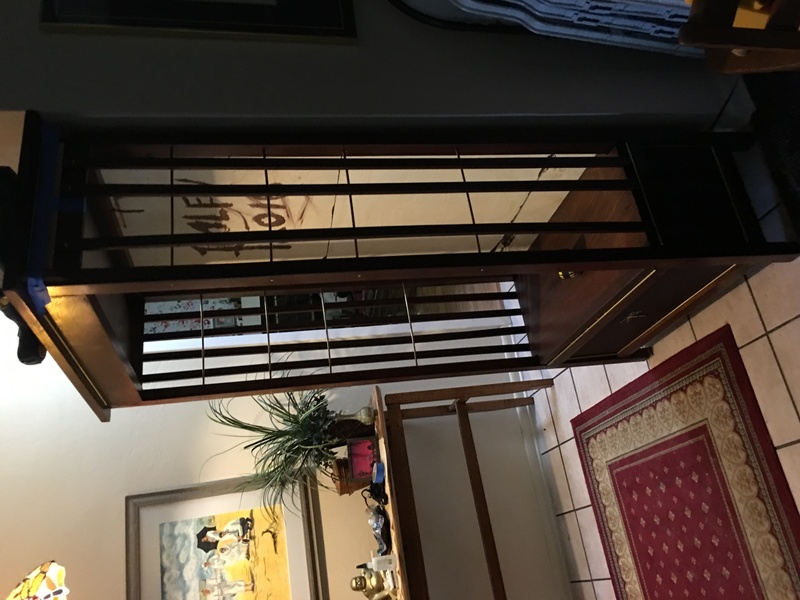 The bottom case of the display cabinet will be enclosed with plywood panels covered in burgundy- colored leather. The leather-covered panels will be framed with brass bar stock. The back of the bottom case will be left open. Some Arts and Crafts accents will be added. More on this later. As I said, the design will be pretty fluid so this initial concept may change as the process moves forward. The initial plan was to etch the leather panels with a laser engraving of an Arts and Crafts motif. 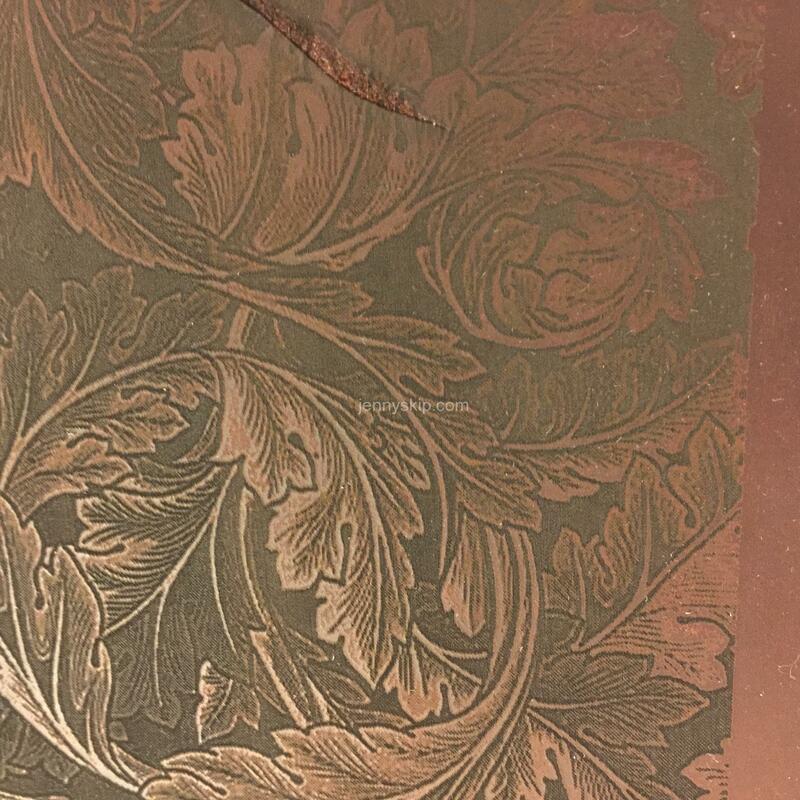 As you can see in the photograph of the test sample, the engraving was too dark and would not be visible in the entry hall where the cabinet would be located. So no laser engraving. As I said, the design is fluid! 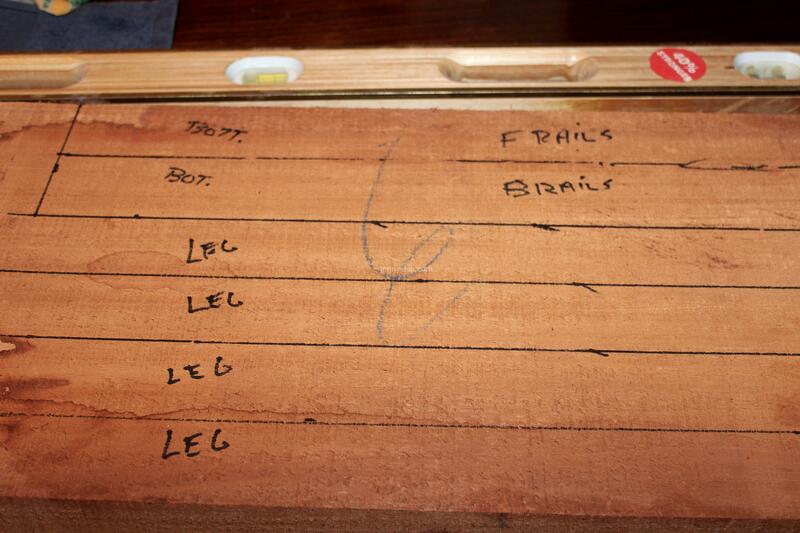 To this point, the legs have been rough cut to 1 ½ inches x 1 ½ inches x 75 inches. All the rails have been rough cut along with their associated mortises. After a dry-fit to test the joints, all the parts will be sanded to 180 grit. 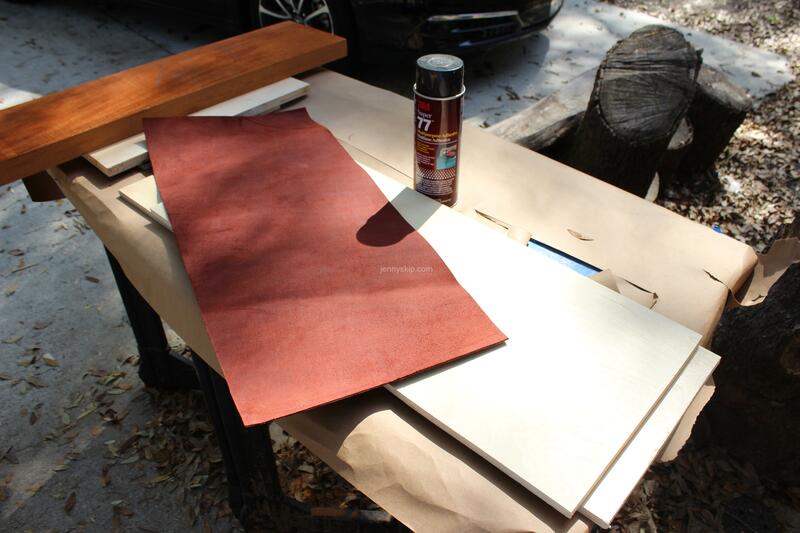 In the next part of the project, I’ll show the preparation of the leather panels and the legs. I’ll also illustrate the preparation of the mounts for the shelving, and the glue-up for the cabinet top and lower shelf. I have ordered some bar stock from my local Ace Hardware. This is a locally-run hardware store, and the people who work there are fantastic! So instead of running to the Internet for everything or going to the big box stores, I try to support this locally-run store. Besides, they have a great store cat, a red tortoiseshell tom cat who welcomes everybody at the door. It reminds me of the hardware store in the small town where I grew up, which had a store cat, and a Mr. Hubbard who would take out his glass eye and let my brother and me play with it!